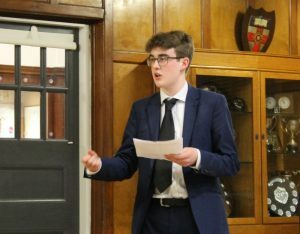 Sixth-formers took on Old Elizabethan opposition to debate one of the biggest questions of our era – whether there is a future for democracy. 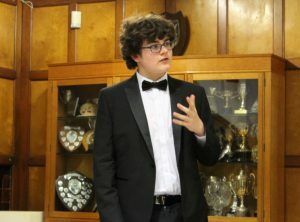 More than 170 guests, including Old Elizabethans, Year 12 pupils and staff, attended the 54th Elizabethan Union Annual Dinner Debate. The debate is a formal event which helps sixth-formers prepare for similar occasions at university and, later, in their professional lives. At the start of the evening, an indicative vote on the motion, This House believes democracy has had its day, revealed that a large majority – around an 80:20 split – opposed it. However, the School team successfully shook the faith in democracy of some 15-20 people, who had swung to their side of the argument by the final vote, thus technically giving the School victory in the debate. Nevertheless, a majority – albeit now reduced to 70:30 – remained opposed to the motion. The School team of Chris Hall and Aryan Jain explained that democracy was failing to solve the big questions and, furthermore, was wrongly identifying what those big questions were. They gave as examples the fact that large amounts of effort were being spent in the UK on Europe and Brexit, but correspondingly less on issues such as climate change, education and welfare. The pair argued that the electorate’s greatest concerns were not always based upon real evidence – a problem they blamed on media distortion. Instead they put forward a form of technocratic government under which the experts could get on with running the country and implementing the right policies, noting that we already entrust large and important sections of government, such as the legal system, to independent non-elected institutions – in this case, the judiciary. “It was perhaps an idealised vision of how such a government might operate, but Chris Hall grounded it all strongly in logic,” said the Headmaster. 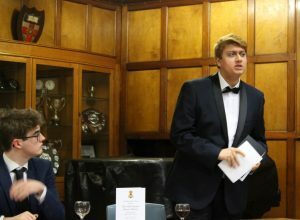 The motion was opposed by Ashwin Sharma (OE 2008–2015) and by Year 12 boy Alex Beard (replacing old boy Jason Thomas [OE 2010–2015], who was unable to attend). 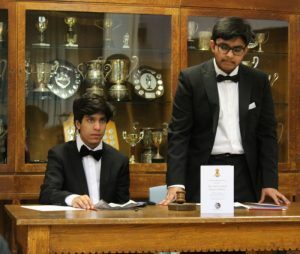 “Ashwin and Alex worked very well together to argue a compelling case, with Alex stepping in very well to complete the opposition and contributing significantly to the very high standard of debating across all the speakers,” said the Headmaster. They argued that democracy is the best system we have. Moreover, the rise of the internet and other new technologies are increasing democratic opportunities around the world, including in countries not typically classed as democracies. Democracy is more than just elections, they pointed out, stating that the very fact that the Elizabethan Union Dinner Debate was taking place was itself evidence of a functioning democracy. 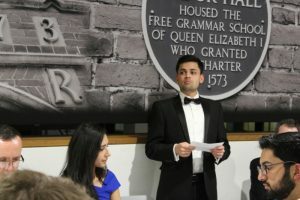 In his after-dinner address Nikhil Patel (OE 2007–2014) recalled his own School days. 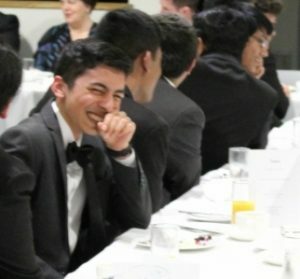 He heeded the advice given on his very first day by the then-Headmaster Dr John Marincowitz to “get stuck in”, throwing himself into School life and later becoming School Captain (in 2013), as well as playing in the First XI cricket squad, captaining the Second XV rugby team and playing the saxophone in several ensembles. They should pursue things about which they are “truly passionate”, he said, before espousing the power and value of friendship: “…always remember your roots and who was with you on this journey when it all started. After leaving QE, Nikhil studied Geography and Management at Cambridge University where he was President of the India Society and captain of the Fitzwilliam College cricket team when they were twice winners of the Cuppers inter-collegiate competition. After university he took a gap year and now works as a Management Consultant for EY and an advisor to WOAW, a content marketing firm. He was accompanied by his partner, Aparna Joshi. Nikhil finished his address with a toast to the Elizabethan Union. 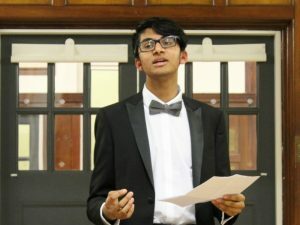 Current School Captain Bhiramah Rammanohar proposed a toast to ‘The Visitors’, while there were also the customary toasts to ‘Her Majesty, the Queen’ and to ‘The Pious Memory of Queen Elizabeth I’. Year 12 pupil Viraj Mehta chaired the debate. The guests enjoyed a dinner of spicy parsnip soup followed by confit of lamb (or pulled vegetables) and chocolate cake.